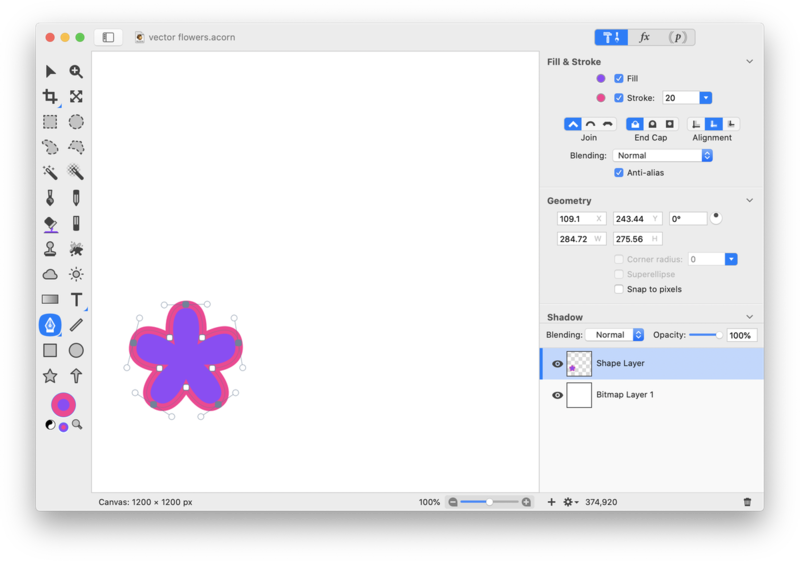 This tutorial will outline how you can quickly create flower shapes in Acorn using the star shape tool and bezier curves. To start, create a new image in Acorn, File ▸ New. The canvas dimensions used here are 1200 x 1000 pixels with a white background. Click on the star shape tool in the tools palette and draw out a star with a fill and stroke. With the star shape still selected, choose Shape ▸ Bézier Stuff ▸ Convert to Bézier Shape. Click on the bézier shape tool in the tools palette. While holding down the option key, click and drag on one of the anchor points located on a star point to curve the sharp edge. Alternatively, you can use the Reset Bezier Control Points tool to make the sharp edges curved. Continue to curve the edges of the star. Click on the move tool and hover over one of the edges of the shape to rotate your flower. Click on the oval shape tool. Uncheck the stroke box in the inspector palette, and then hold down the shift key while drawing your circle to create a perfect circle. Place the circle at the center of your flower. 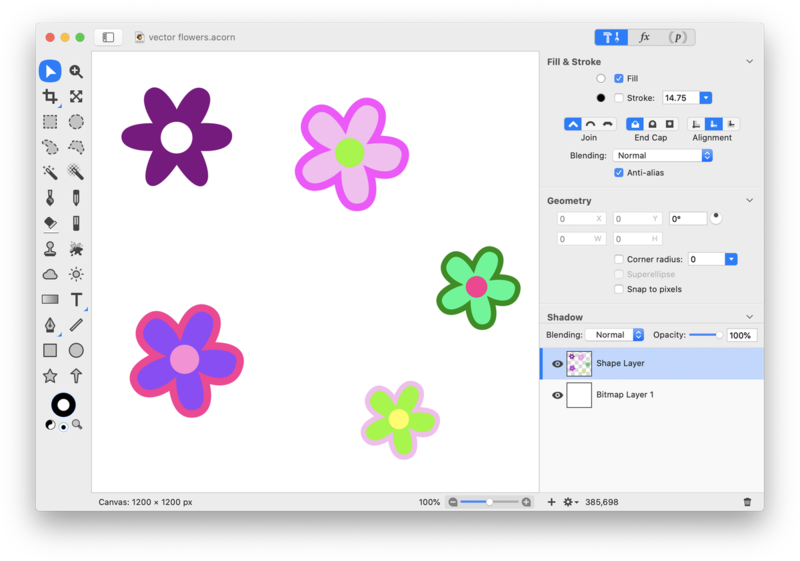 If you want more flowers similar to the one you just made, hold down the shift key while using the move tool to select both shapes. You can use Shape ▸ Duplicate Shape or Edit ▸ Copy and Edit ▸ Paste to quickly make more. Use the move tool to reposition your duplicate shapes on the canvas. 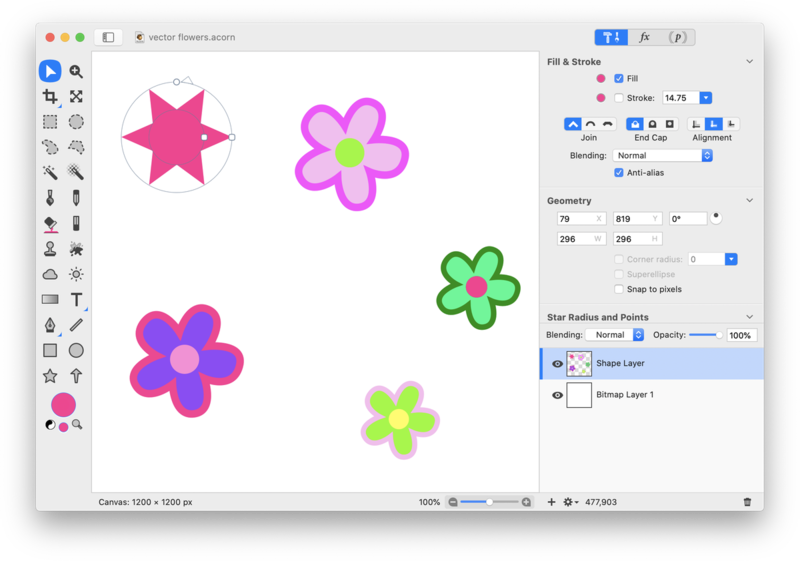 With both the flower shape and its inside circle selected, drag in or out on the shape border to resize the shapes in unison. 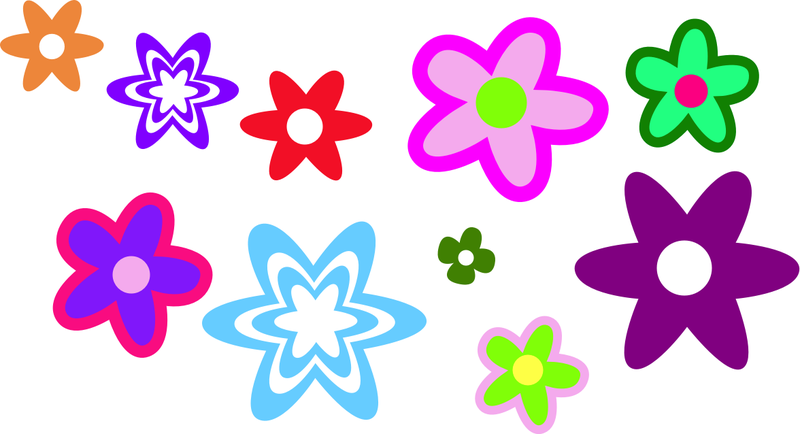 Change the colors of the fill and stroke for each flower if desired. Another style of flower can be made from a six point star. 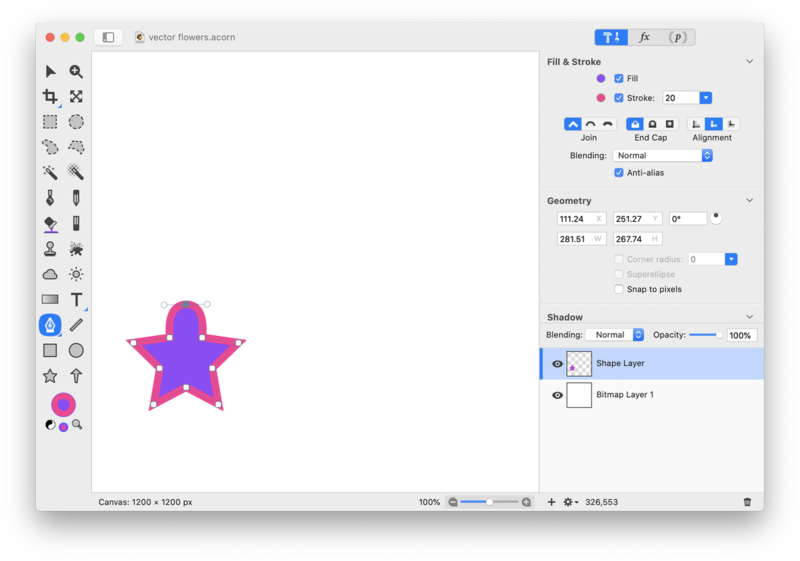 Click on the star shape tool and draw out a star with a fill but no stroke. With the star still selected, use the on-canvas controls to increase the star points or go to the inspector palette and change the number of star points to 6. Follow the same steps as before to convert the star to a bezier shape, then round out the sharp points. Add a circle to the middle of the flower and duplicate, reposition, and resize your new flowers. Another flower variation you can make is to create your flower shape, then duplicate the shape. Hold down the shift key when decreasing the size of the shape to keep the aspect ratio intact and place it inside the original shape. Change the color of the duplicate shape's fill. Repeat the last step a couple more times to repeat this effect within the flower. 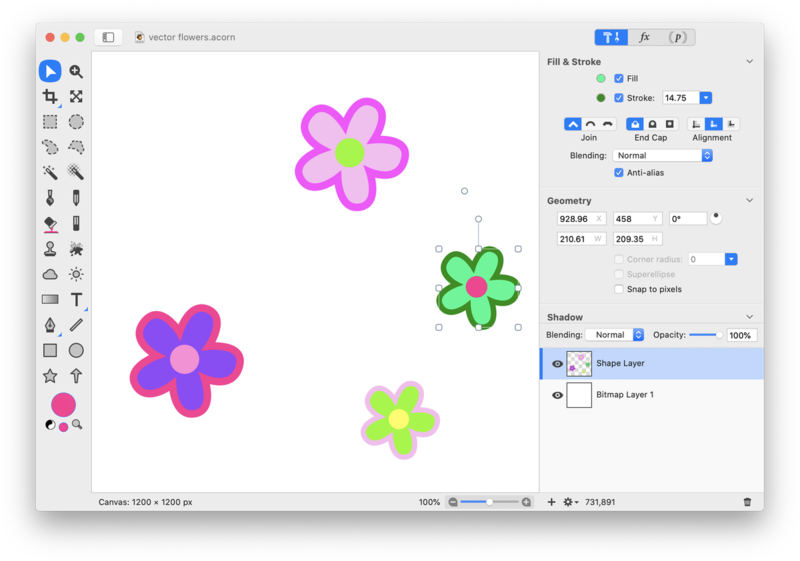 You can select the shapes you just created and duplicate them to create more flowers with this fun appearance. Another flower was added to the image below by creating a 4 point star. Play around with countless combinations to create fun vector flowers!